It took days to create and test this template to sure it creates a realistic picture. Help us make it better by answering this one-minute survey and receive 10% off your first order. Here are three examples of folder mockups created by exporting artwork from a die cut template and applying it to the mockup template. 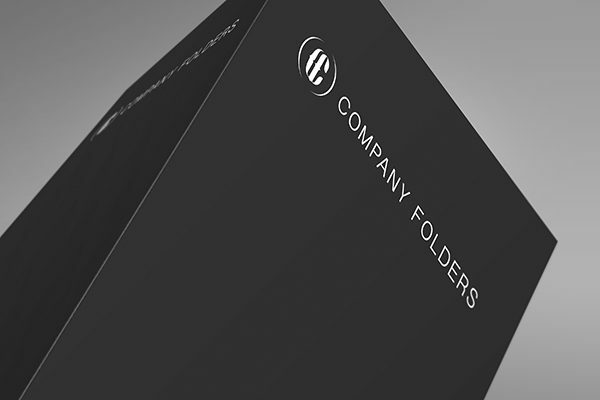 This mockup places your presentation folder in a “tent” position and gives the viewer a detailed look at the upper portion of the design. The primary focus is the upper front cover, with some of the back cover also visible. This Photoshop (PSD) mockup template can be customized with either square or rounded corners, as well as a folder design of your choice or creation. You may share and alter these images for commercial or non-commercial purposes as long as you credit the artist. Customizing your mockup template is as easy as opening each smart object and replacing the image; then just save the file and you’re done. It’s really that simple. Watch the video below for a demonstration, or learn advanced mockup editing techniques. This mockup template can be used to create realistic images of any of these products. In several cases, minor alterations may be necessary to simulate the following products. These high-resolution images of our 64 paper stocks make a great addition to your mockup, especially when you want to show your client how a design will look when printed against a certain color or material. We’ve gathered up some of our favorite background images and textures to use with our folder design mockups. Browse over 250 mockup backgrounds ranging from real-world textures to abstract pools of color. It’s not always easy to get a sense of how an imprint will look just from the raw files. This tutorial shows how to use simple Photoshop techniques to simulate an embossed or debossed look in your mockup.